Now that Column Formatting has begun rolling out to SharePoint Online tenants, I decided to look at some older use cases and test how they could be achieved with this new functionality. Here’s what I created (code below), to test the formatting of the bar with different colours, as well as different other CSS styles (text alignment). Thank you for your article. It is very informative. I have an interesting question for your format. Progress is usually associated with completion (blue). 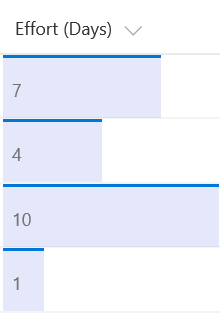 What would it take to have the progress % be blue, and the background color of the bar (= 100%), associated from a separate column? Your “status” (Red, Yellow, Green) could be different for various reasons not associated with the progress. So, if your progress is 50%, 1/2 the bar would be blue. If your “status” column (choice) is Red, the second 50% of the bar would be Red. 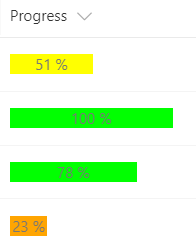 Go to status column, change to yellow, then second 50% would be Yellow, and progress 50% is still blue. Dumb question, but where do you put the code? I’m using SharePoint 2016. Hello Can you add a step by step process to add the code ? where do we add it ,? do we need a webpart ? etc etc pleaaaaase !